Millions of tiny twinkles punctured the final moments of twilight. Vibrant streams of metal machines pulsed through dark streets and over bright bridges, making the whole lit landscape appear fluid. An unexpected warm breeze passed in between the giant steel and glass structure protecting me from a seventy-storey fall. Night had fallen over one of the world’s favourite skylines. I love a good view. Nothing serves to remind me more how huge this planet is. Whether I’m atop a mountain or high above an urban sprawl, I delight in feeling insignificant. 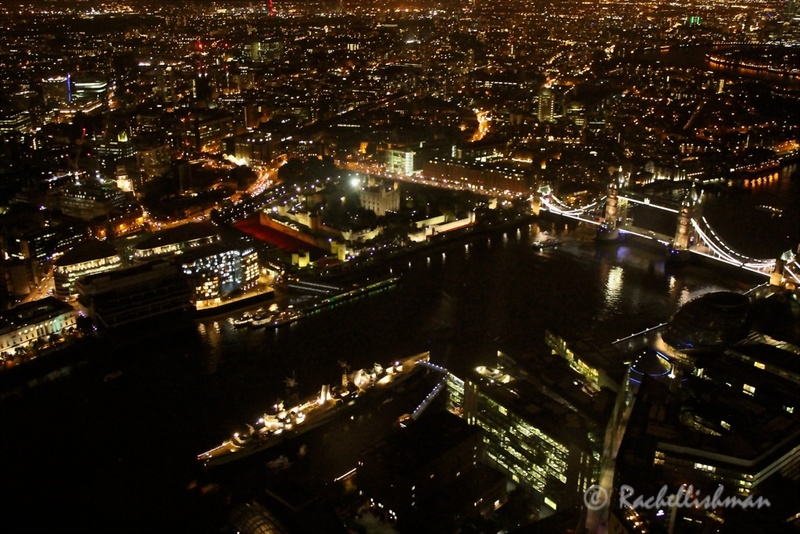 For October’s Monthly Mission, I finally summited The Shard: Europe’s tallest building. Having spent months looking forward to to this experience, I was happy to pay the £30 to get up to the top. However, because this is a very pricey lift journey, it set my expectations high. 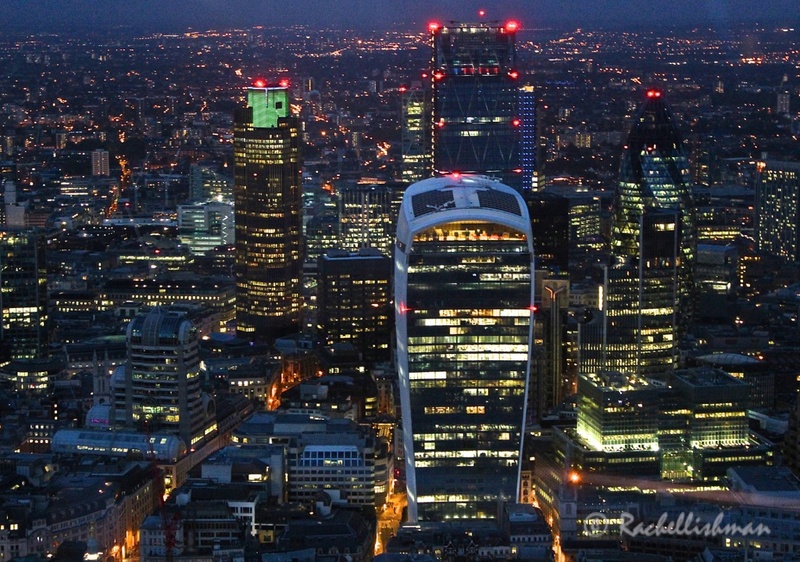 I hoped that I would get my money’s worth from the best vantage point in London. The good thing about the ticket is that there’s no time limit, so once you’re up there you can do as many laps of oohs and aahs as you like before going back to earth. Fortunately, I decided within five minutes of reaching the top that it was worth the price. I got drawn straight to the corner overlooking the London Eye. A wide, dark railway track led outward from where I stood, towards the giant wheel that glowed an ethereal blue on the river’s edge. It was a perfect starting point. I gradually worked my way round the glass, stealthily dodging eager tourists and daters clasping glasses of champagne. Soon I was hovering directly over London Bridge Station. Maybe I’ve been working for an engineering firm too long, but the structure was really beautiful. Multiple tracks with covered platforms peeled away from underneath me like the slim petals of a flower. Passengers waiting for their ride home gathered and scuttled like ants under the station’s bright lights. The backdrop of the scene combined some of the city’s older works of art: Tower bridge glowed, seemingly suspended over the black river, and just to my left, stood the Tower of London, lovingly backlit with its moat of red poppies, proud that its modern neighbours will never quite outdo it. 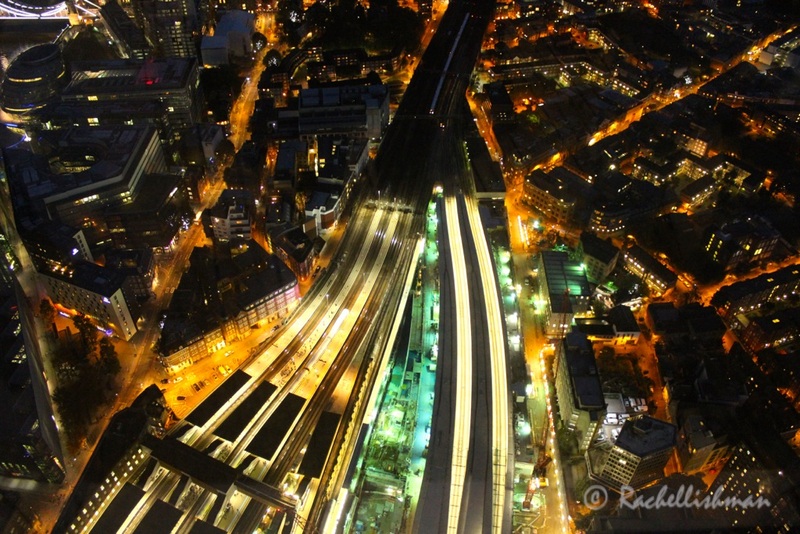 London Bridge Station from above – engineering at its prettiest! Still, those modern neighbours are pretty impressive. The Walkie-talkie, The Gherkin and The Cheese Grater huddled together like a cool group of teenagers, dominating the horizon to the north. Their yellow windows frame the silhouettes of late workers marching through their offices. As I came to the end of my first lap (there were many more – as I said, I was getting my money’s worth!) St Paul’s sat stoically across the Thames. 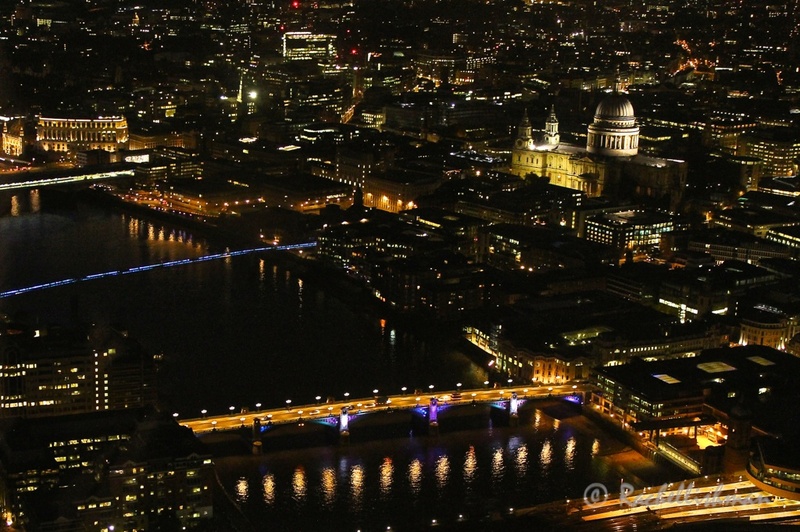 Bridges covered the water at regular intervals, their lights reflected in different shimmering patterns. The ancient nestled comfortably next to the new, all of it magically illuminated, for what felt like our viewing pleasure. I’ve known for a while now that I live in a spectacular and absorbing place, but this view sums it all up pretty efficiently. A feat of contemporary architecture shows off an age-old cityscape that’s changing before our eyes into a 21st century global business hub. Bustling from the ground upwards like the rest of the capital, The Shard certainly makes you realize that London is, and always has been, a force to be reckoned with. Great photos and post! Thanks.